The multi head weigher is ideal for irregular shaped product, and comes with either 10, 14 or 16 weigh heads. It is a combination weigher, which computes a total weight from approximately 5 of the weighers, to give the nearest actual taregt weight. These weighers give both accuracy and speed. 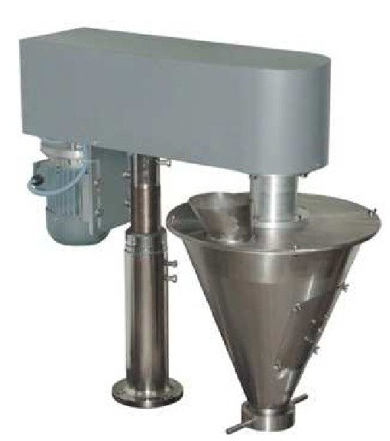 The auger feeder can be table mounted for hand presentation of pre-made bags. The auger is controlled by a foot swtich and the delivery is controlled by an accurate servo motor, and set through a touchscreen. The table is all stainles steel construction and the height of the table can be to the customer requirements. As above, the auger feeder is easily adapted to fit on and VFFS machine and with servo control is extremely accurate in delivery. A similaer auger feeder, with servo control, can be adapted to have up to 6 discharge poing, for us on multi lane stick pack machine or sachet machine. Very simple to set au from the VFFS touch screen, for delivery weights and stirrer activity. 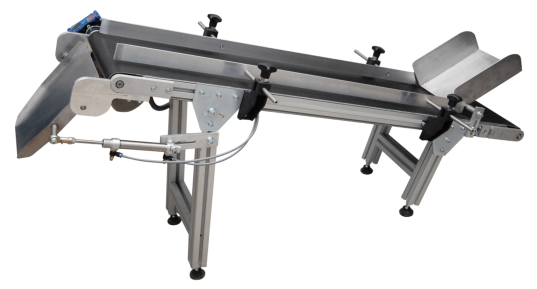 We can supply inclined take away conveyors to go with all of our machines. The are idally sized and inclined to raise packed product from the discharge of the packing machine, to a working packing height, sucah as a packing table. Either single phase or 3 pahes conveyors are available and the length will be to suit the customers requirements and situation.